A business’s corporate interiors speak a lot about the company. For this reason, it is imperative that owners invest in well-designed interiors that let you build your brand but without breaking the bank. Companies build buildings not just so that they can house their human resource and equipment but also to promote the brand. Custom corporate external building design is critically important but it what is inside speaks louder than what’s outside. The interior of the building is part of the corporate climate’s soul. For entrepreneurs seeking to build a custom corporate climate they wisely invest in polished and professional corporate interior designs. 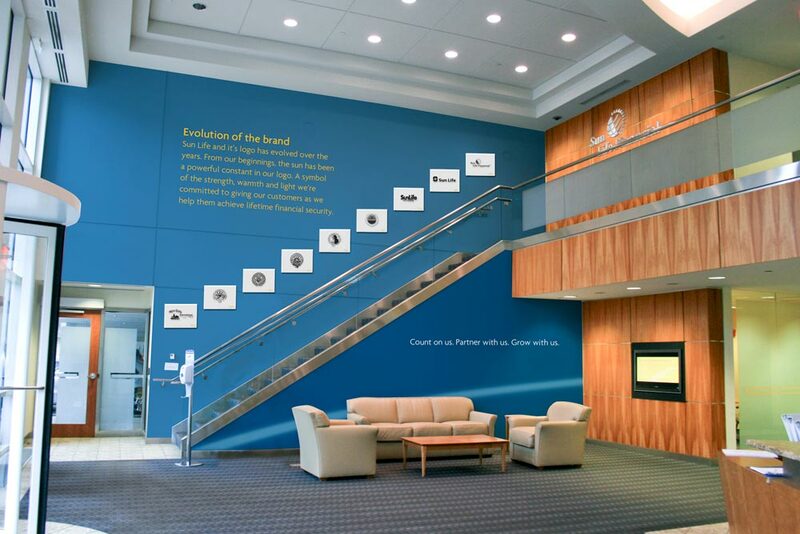 Corporate interiors help the company secure a good and lasting impression. Interior design bosting attention to detail delivers the factual conclusion that your company puts the needed attention to the little things that separate the good from the best. The colors to be used, the arrangement of the chairs and tables, the positioning of front line employees, the curtains and blinds, the dividers, and everything else will be taken into consideration when talking about corporate interiors. Our corporate interior designers here in Boston, MA ensure that the our business clients put their best foot forward each and every time their clients walk through the door. When done professionally, corporate interiors will help close deals, open new relationships, and contribute largely in the goal of the company to uphold an image of excellence. To find out more about the available options for developing unique and dynamic corporate interior designs, contact The Exhibit Source. When doing business, there are three important things that entrepreneurs should ensure: product, price, and promotion. So given that you already have a product now you must address your marketing strategy. Trade shows are alive and well in American business and the great news for you business owners is that there is a wide range of rental trade show displays for you to choose from. If trade show promotion of your goods and/or services is part of your marketing plan, then consider The Exhibit Source’s trade show table top displays here in Boston, MA. Your trade show promotion can make a huge positive difference in your revenue generation. Your competitors are likely using trade shows in their marketing strategy. Luckily for your business owners out there, there is no need to purchase, own, and maintain your own trade show displays. Our portable table top displays can deliver rock solid marketing effect without the high cost of trade show display ownership. To find out more about trade show table top displays and other marketing options, contact The Exhibit Source. When talking about business profitability, it is not sufficient to simply offer the best products at the best price. You need to put the best quality and priced products and services in front of the consuming public. One thing that business owners fail to excel in is the art of product and service promotion. While there are many ways to do this, one effective method of product promotion is the use of portable promotional kiosks that we provide here in Norwood, MA. The business promotion effectiveness surrounding touch screen information kiosks is undeniable. When customers feel that they are personally involved in the purchasing decision (such as they are during trade show exposure), they are more likely to respond positively to your intended call to action. The amazing thing about kiosks is that they use technology to relay important information about the product. They have wide screens where products, and even services, can be strategically displayed and be made known to carefully selected target market. These screens often have touch mechanics that allow anyone to jump from one screen to another thereby making learning about a particular product more interesting. These touch screen information kiosks offer a different experience that will really lead one to use his or her purchasing power and never miss out any promo. The portable marketing kiosk will positively affect you and your company’s brand. The content can be conveniently customized so it is always ensured that information being provided is always updated. This means that the kiosk can work perfectly even for those businesses that offer different products and promos each season, if not almost every month. For tips on how to maximize market presence using portable marketing kiosks, visit The Exhibit Source. When renting or purchasing trade show displays, one important characteristic that you should strongly consider is flexibility. If you want to maximize the use of your exhibit, it should have a versatile graphic and structural design that lends itself to easy modification and reuse. Our trade show exhibit displays dispatched out of Boston, MA offers flexible booth designs that can be tailored to your company's brand, concepts, and current marketing strategy focus. Their footprint can be adjusted to match different trade show space allocations. Flexible also means simple installation and dismounting. The entire display can be transported and stored with ease. Make sure every dollar you spent on the acquisition of your trade show exhibit produces positive return on investment. A flexible, versatile, and re-usable set-up is definitely a smart and practical strategy for your trade show exhibit. Contact The Exhibit Source for versatile trade show exhibits. Participating in a trade show event is a bold move to boost your marketing efforts. Trade show administrators often charge significant fees for floor space. The good news, however, is that the cost of your trade show display need not be so much of a shock. There's an alternative option where you can still have a unique trade show exhibit without breaking your marketing budget. Boston entrepreneurs increasingly turn to The Exhibit Source for rental trade show displays such as our 10’ x 1-‘ trade show display. 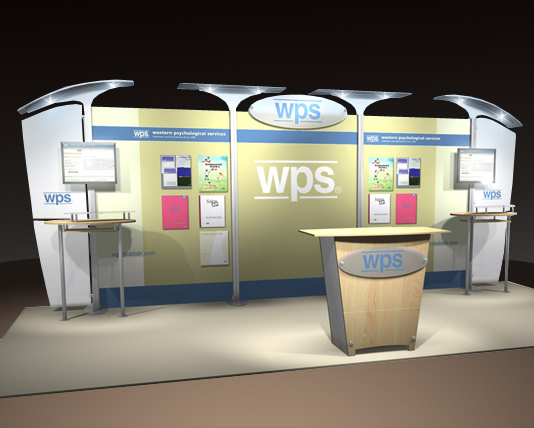 Rental trade show exhibits provide quality and unique graphic and structural designs that will effectively draw attention of target audiences. Our products offer extensive license for you to customize your rental display. You can add, remove, and adjust all the elements of the display to conform with the specifics of the company without the full investment of ownership. Having an extraordinary exhibit provides an opportunity to promote your brand and entice prospects. Selecting the proper accessories to meet your sales goals can make the display more competent and can help make your booth more prominent in the exhibit hall. Renting a trade show booth is an economical way to stick within the budget parameters yet still hand over positive results. Contact The Exhibit Source for customized trade show exhibits. Trade show displays offer a path to wide exposure of your brand and services. 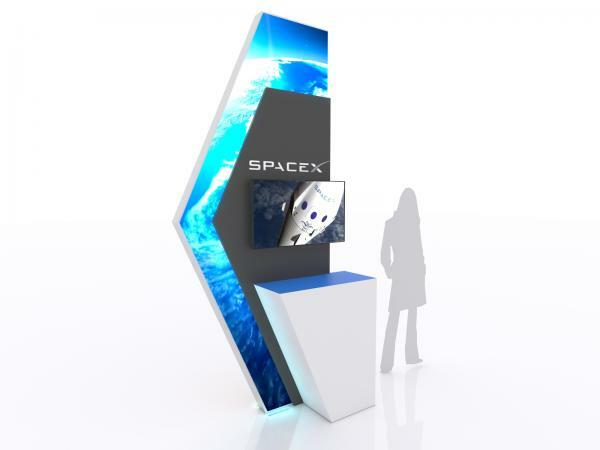 Constructing an impressive trade show booth design can be a challenge to say the least. The look of your exhibit display is crucial since it portrays the quality of your product and level of service that you intend to communicate to consumers. Helping you generate that perfect look is what we are all about! Selecting the right trade show structure and design is critical. If you want to create a lasting impression in any marketing event, our portable island trade show exhibit are absolutely striking and spectacular and will surely impress your target audience. Our portable island exhibit displays feature a 360-degree view which commands attention from all directions. This maximizes exposure during crowded events. The 360-degree view also exposes your brand to people that might have otherwise walked passed your exhibit from an unviewable back side. Along with vast option of stock graphic and structural exhibits, by all means (and with our encouragement) you can customize any display and you can customize to any degree. You may accessorize it with ambient lights and informative touchscreen kiosks that can make your booth more attractive. Contact The Exhibit Source to find out more about portable island trade show exhibit. Your marketing budget is always a major consideration when planning your trade show strategy. You need to consider the expenses for the booth space fee and your exhibit display itself. Although there are vast options for trade show booth designs, very few trade show exhibit service providers provide a full range of options as it pertains to size and cost. Our table top trade show displays are an incredibly effective marketing tool that is sure to fit into even the tightest marketing budget. Economical but powerful trade show table top displays here in Boston, MA offer multiple benefits beyond simple affordability. They are portable, light-weight and easy to assemble. This simplifies your set-up and tear-down process thus putting you and your staff quickly on to new productive ventures. Most of our tabletop displays are assembled in minutes empowering you to kick start your marketing activities right away. This maximizes your time in the trade show hall. Moreover, you can have the leverage to customize your design based on your allocated space and the type of event. Our table top displays may very well be one of THE most effective use of your marketing budget, period! Contact The Exhibit Source to find out more about the advantages of trade show table top displays. You and your business can gain new leads and increase your profit when you take part in trade show events. In just a short time frame, you can boost your sales and your brand. However, venturing in trade shows must be planned and implemented properly. Helping you improve your brand and bottom line is what we do here at The Exhibit Source. 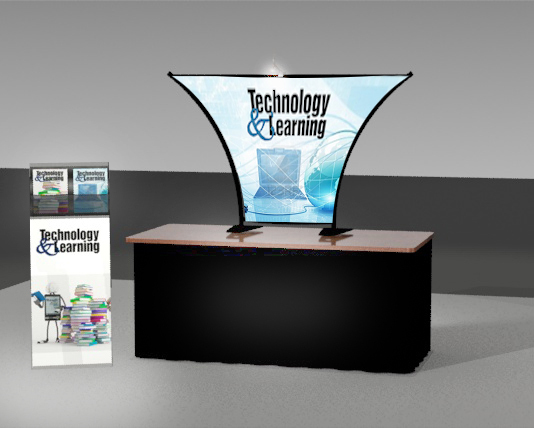 Helping you design and deliver an effective trade show display is what we are all about. Finding the right creative support team to help make your graphic and structural exhibit design is critical to returning true return on your marketing investment. Trade show display must be tailored to your brand style and color scheme so people can easily distinguish and familiarize your company and your product. Your marketing details must be smartly formulated so the message can get across your targets. These are just few things that must be taken account when creating a competitive trade show display. The Exhibit Source in Boston, MA can help you produce the perfect trade show booth for your marketing event. We have the right experience and skills in designing durable and effective trade show exhibits. So on your next trade show event, contact The Exhibit Source. We will help you ace the game. Participating in trade shows can be fiscally intimidating but it shouldn’t be. If you want maximum brand and product exposure on a limited marketing budget, then strongly consider renting a trade show booth from Boston’s trade show booth icon. 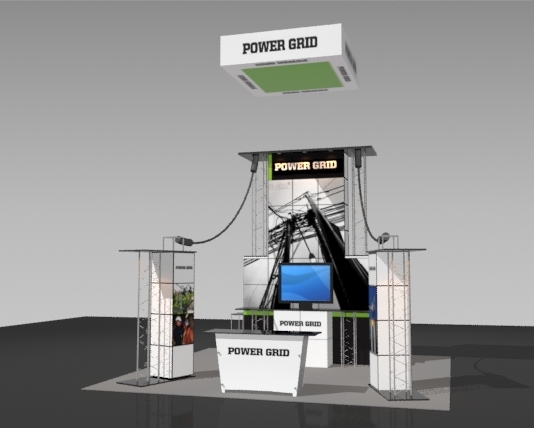 Our rental trade show booths are customizable and rapidly deployable. Renting a trade show display can be a better option than purchasing a trade show display given the fact that you can change your displays out thus giving you and your brand a recurring fresh new look and feel. Rentals eliminate the cost of storage whether it be within your warehouse or within rental storage space. We’d love to talk to you about how rental trade booths can positively affect you and your company’s brand. Contact The Exhibit Source to find out more about trade show exhibit rentals. Most people are fascinated with something new to the eye. This is exactly why your trade show displays must be periodically updated. 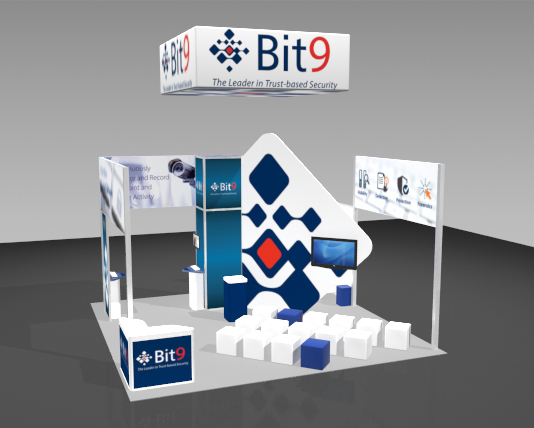 If you aim to catch attention, then you need to update the look of your old trade show setup. One way you can do this is via fabric pop-up displays. They are easily modifiable thus empowering you to style your displays with fresh new looks. 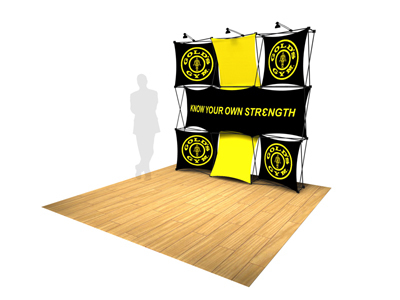 Our pop-up trade show exhibits in Boston, MA deliver a striking presentation that is easy to assemble and take down. Its frames and covers are made from durable materials, but incredibly lightweight. This means it won't easily tear and tend to last longer despite constant use. And since it is absolutely portable, installing and dismantling it right after the event is a breeze. This convenience can benefit your business a lot since you can start marketing right away and can maximize your time and space in the trade show fair. 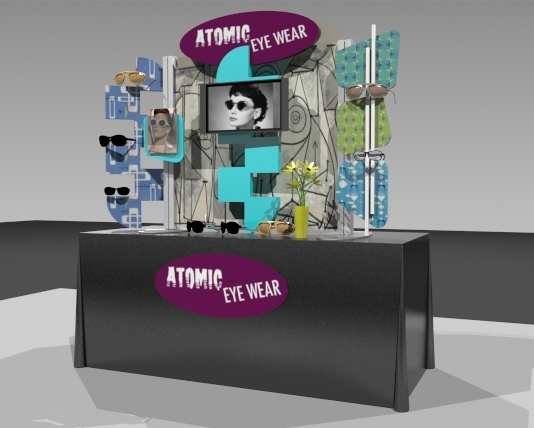 The customization design for pop-up trade show displays are limitless. You can easily upgrade the setup with additional accessories and the graphic and structural exhibit design can be conveniently be modified for a fresher look. The foot traffic will definitely increase in your booth when your display can pop up with large, vibrant colored images and texts. To find out more about pop-up trade show display, contact The Exhibit Source.